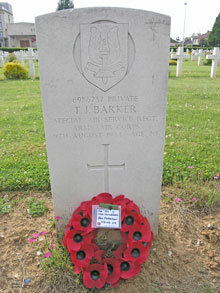 Private Tot Barker was born in 1924 and the son of John & Florence Barker, Cookstown, Co. Tyrone. Prior to enlistment Tot worked with Messrs David Anderson & Son Grocers, Cookstown. At the age of 17 he joined the Royal Inniskilling Fusiliers. A month before his 18th birthday he transferred to the Royal Ulster Rifles. 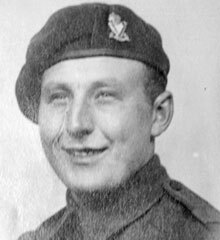 He later became a paratrooper with the 6th Airborne Division and finally joined the Special Air Service. On the night of 4th July 1944 a unit of paratroopers was taken prisoner and executed on the 8th. Marissel is an eastern suburb of Beauvais, a Cathedral town between Rouen and Compiegne. The Cemetery, known locally as the 'Cimetiere Militaire National de Beauvais-Marissel', is not actually in Marissel. It is located approximately 1 kilometre north of Beauvais town centre on the Rue d'Amiens (D1001). The Commonwealth war graves are mainly located along the left-hand wall of the cemetery. Others are near the French monument and along the central section.